Our next stop after KL was Siem Reap in Cambodia, a medium-sized town close to the Temples of Angkor. We (finally!) decided on a travel plan: we will travel through Cambodia, cross over to Vietnam in the south, eventually hitting Hanoi in the north, where we will cross over to Laos, and then travel to northern Thailand from there. At that point, we will either make our way back to Bangkok before heading to Malaysian Borneo to dive, or we will fly straight from Chang Mai in northern Thailand. It feels good to have a plan, even if it is a loose one, and we are still keeping our eyes and ears open for travel suggestions from friends and other travelers. We flew from KL to Siem Reap for about 335 ringgit (approx. US$95) each (again, AirAsia). It was quite convenient because they issue visas right at the airport (US$20 per person) in Siem Reap. Immigration officials wanted payment in US dollars, and luckily, ATMs at the airport only dispense US dollars. We would come to find out that all of our financial transactions in Cambodia would be done in US currency, but they use Cambodian rials as “coins” (they are actually bills, but if you buy something that costs less than a dollar, you purchase it with rials). It works out quite well because the exchange rate is currently about US$1=1600 rials, so $0.25 is 400 rials. We tried to buy a bottle of water for $0.50 and I busted out some quarters that I had been carrying around since we left the States. The vendor looked quizzically at the quarters and then examined them like they were exotic gems: he had never seen US coins before. On a recommendation from Jeremy’s friend Renee, we headed for Mandalay Inn (http://www.mandalayinn.com/), in the Psar Chaa area of town. 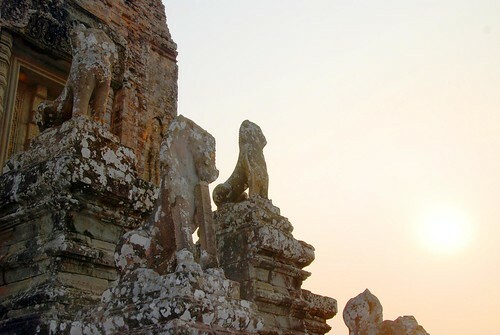 We had read up about Siem Reap in the Lonely Planet before we arrived, but we couldn’t quite tell if this was a good area to stay; instead, LP listed three different areas to choose from. 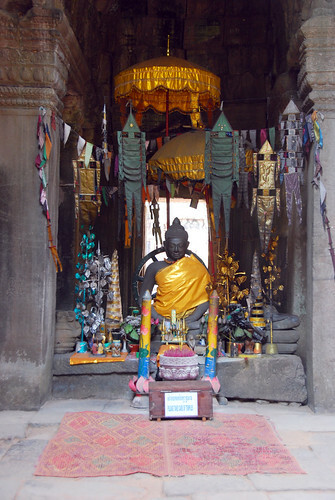 It soon became very apparent that backpackers wouldn’t really want to stay anywhere else in town but the Psar Chaa area—it is close to the restaurants, markets, and tuk-tuk drivers waiting to take you to the temples. Plus, Mandalay Inn was not only cheap (US$10 per night for a double with AC and private bathroom), but it was super clean, and it has free wi-fi, plus a beautiful, peaceful courtyard in the front. The staff was incredibly friendly and they went out of their way to make us comfortable. We found out that Siem Reap has a hospitality training program, and it was obvious that a lot of the people who worked at Mandalay Inn attended that school (often in a really cute way—after ordering our breakfast, the waiter would say “Now I am going to repeat your order back to you!” before he actually did it). Really, this may be the best place we stayed in all of SE Asia thus far, and one of the cheapest. We cannot recommend the place enough. Thanks for the rec, Renee! We made our way to the temples that afternoon. We were originally planning on riding bikes from town to the temples, but when we realized that it was 14km away from town (AND we had gotten up at 3AM to catch our flight in KL), we decided to take a tuk-tuk. We literally were barely out of the hotel door when a driver approached us and offered a ride. 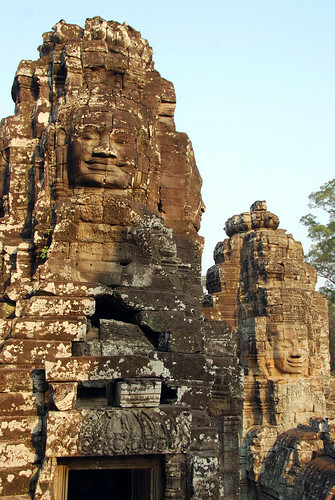 We negotiated US$6 for the ride since we were only going for a half day, and we headed straight for Angkor Wat, the largest and most famous of the temples of Angkor. It did not disappoint. 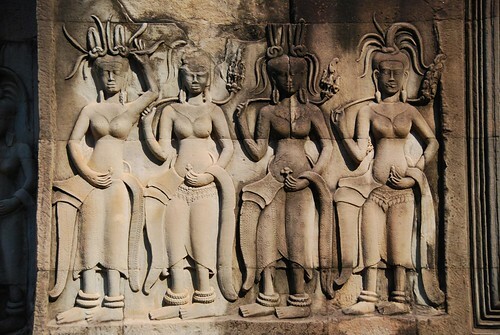 The temples of Angkor were built as an act of spiritual devotion (first Hindu and then Buddhist), and they served as the capital of the ancient Khmer empire. 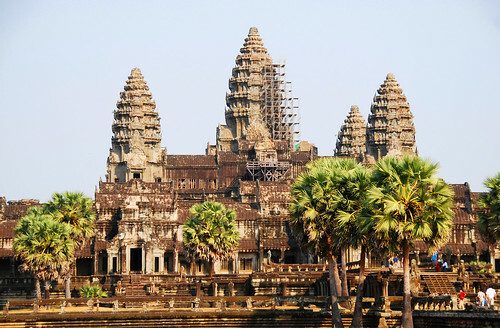 Angkor Wat is the crown jewel of the temples; it is the largest spiritual building in the world. Cambodians are incredibly proud of this little piece of architecture (as they should be). 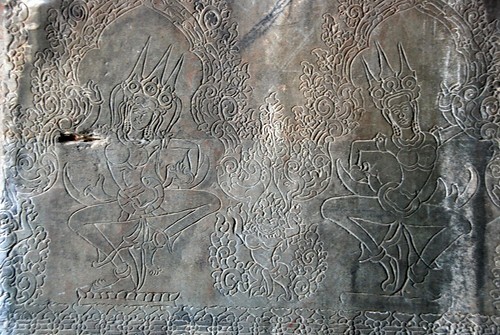 We were blown away not just by the size but by the incredibly ornate carvings that cover the walls. We were also lucky enough to catch a random Khmer dance performance in the center of the temple. The following photo might be one of my all-time faves! 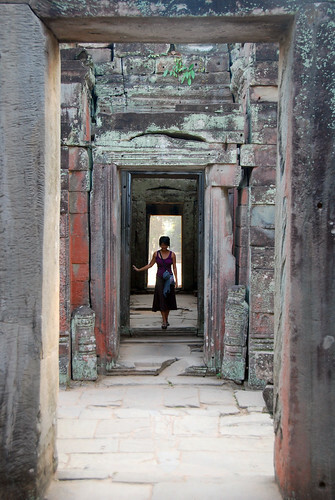 Preah Khan, the temple of hundreds of doorways, was one of my favorites. The doorways get bigger as you near the center of the structure, and apparently this is supposed to symbolize the unequal nature of Hinduism. As I was walking through this temple, however, I interpreted it differently: I saw it as the spirit inflating as you near the heart of the devotional structure, and the body slowly returning to its earthly form as you bend and duck to leave the temple grounds. 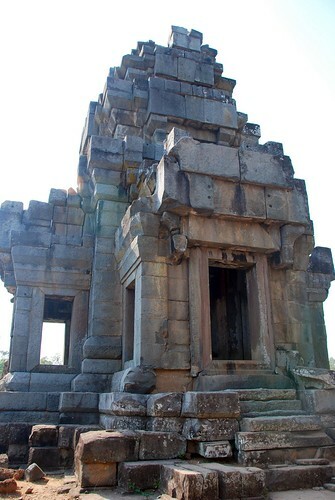 We were also really into Banteay Kdei, which was never completed. There was something really modernist and modular about the structure that appealed to both of us. 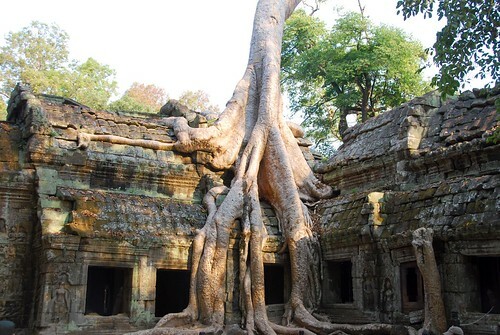 And, of course, we can’t forget Ta Prohm, where tree roots are oozing in and out of the buildings. 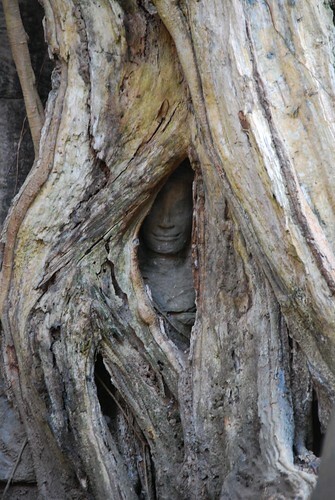 Part of Tomb Raider was filmed here, which makes this temple the second most popular after Angkor Wat. 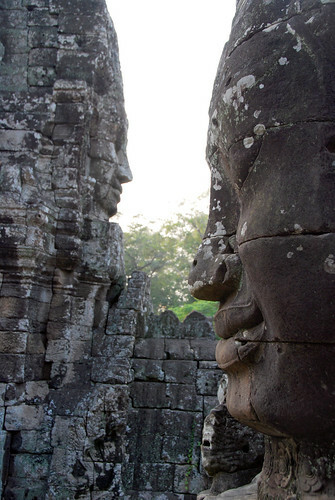 By the way, we actually watched Tomb Raider while we were in Siem Reap…why not? We watched a really nice “sunset” at Pre Rup. I put “sunset” in quotes because the sun never really sets—it just disappears into the layer of smog above the horizon. Still, it was a nice way to end the day and we met some nice people here too. 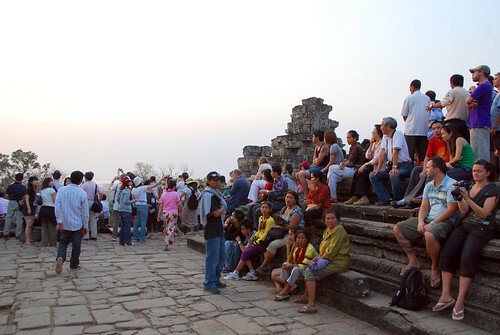 One place you might want to avoid for the sunset is Phnom Bakheng. We were taken there for our first sunset and while it’s a great place to watch the sun go down due to its setting on a hill, the crowds there make it a zoo. The peanut gallery waiting for the sun to go down. 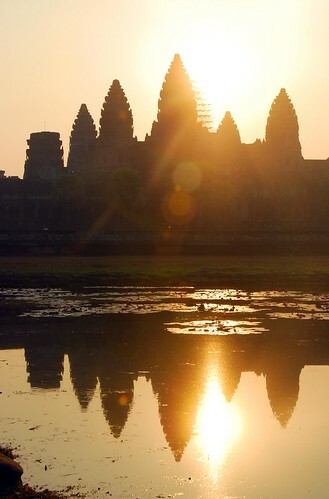 Speaking of the sun, we did do the whole “Angkor-Wat-at-sunrise” thing. 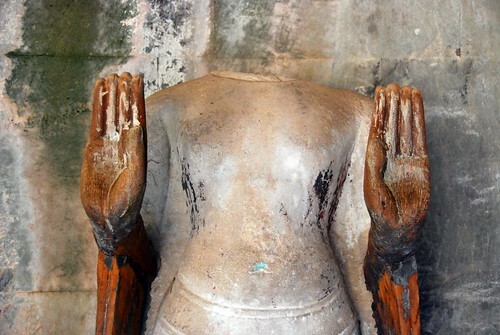 This is a very popular activity for tourists, so it’s not exactly the serene, spiritual experience you might desire. Just don’t expect to be alone out there (you won’t be). Still, it is beautiful, despite the 5AM wake-up time (ouch!). 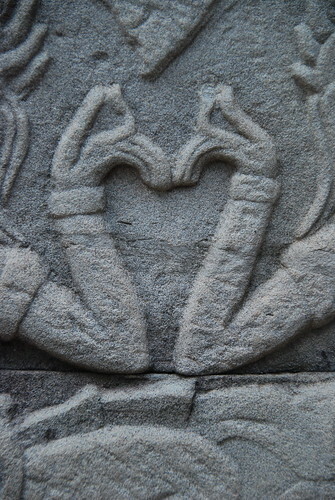 In addition to the grandeur of the temples, the details are what really make the place come alive. Yes, the temples are touristy. 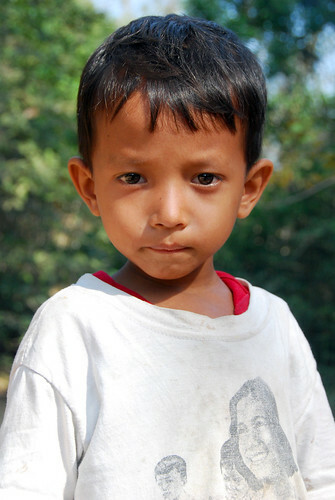 But unlike southern Thailand, we saw a lot more than European and American faces here. 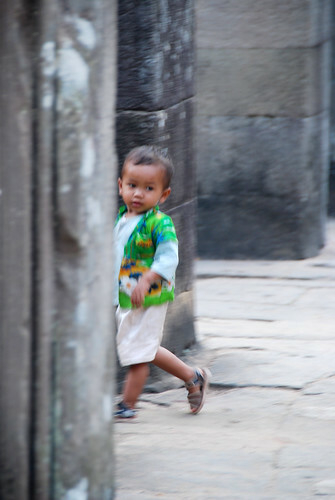 There are families that actually live near the temples and sell to the tourists that visit the park. On that note, let’s have a word about the children. This little guy stared at me (just like this) until I shot this photo and showed him the screen. Then he broke out into the biggest, most beautiful smile. Oh my, are they beautiful. But heartbreaking too, as each one is begging you to buy whatever they happen to be selling (cold drinks, bracelets, fresh fruit, wind pipes…wtf?). It’s hard because their families have sent them out to sell to tourists because they know it’s hard to say no to a child. But they should be in school and you don’t want to give them an economic incentive not to get an education. These are the extremes of Cambodia on display: poverty set amongst the beauty of the people and the magnificence of the temples. One of our tuk-tuk drivers told us that a person working for a company in Cambodia makes about US$30 a month, whereas a tuk-tuk driver can make US$10-15 a day. Plus, we have heard that corruption here is rampant, so any foreign money coming in to help eradicate poverty will inevitably line the pockets of many politicians before it reaches the people who really need it. Since we left Siem Reap, I have found myself wishing that we would have stayed longer, not only because we really liked the town, but also to have a chance to visit an orphanage or volunteer in some other way. Even though I regret not giving back to Cambodia beyond my US dollars, I’ve been inspired to keep my eyes open for opportunities that may come up as we get further along in this trip.